Double feature DVD containing two rarely seen works featuring Nigerian musician, composer, multi-instrumentalist, and human rights activist Fela Kuti. This one-of-a-kind Fela Kuti DVD brings together the 1984 documentar Teacher Don't Teach Me Nonsense, as well as the concert film Berliner Jazztage '78, considered by many to be the best live footage of Fela Kuti ever captured on film. New York, NY - August 3, 2012 - Kino Lorber is proud to announce the release of a double feature DVD containing two rarely seen works featuring Nigerian musician, composer, multi-instrumentalist, and human rights activist Fela Kuti. This one-of-a-kind Fela Kuti DVD brings together the 1984 documentar Teacher Don't Teach Me Nonsense, as well as the concert film Berliner Jazztage '78, considered by many to be the best live footage of Fela Kuti ever captured on film. 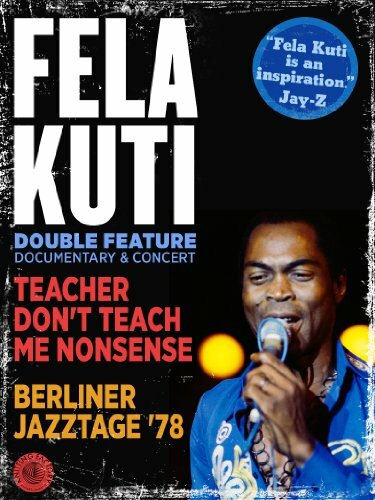 Kino's Fela Kuti: Teacher Don't Teach Me Nonsense & Berliner Jazztage '78 (Double Feature) disc is currently available with a SRP of $24.95. As a pioneer of Afrobeat and a seminal figure in the history of world music, Fela Kuti has created an outstanding artistic body of work that continues to influence new generations of musicians and fans. His political activism ignited revolutions in Africa and his music inspired generations around the world. Teacher Don't Teach Me Nonsense (1984) is a rarely-seen documentary, mixing candid interviews of Fela Kuti with selected live segments from his stirring performances. Examining his life, music, and political views - this feature serves as an important guide for anyone yearning to learn more about a transformative artist in the history and development of African music. Originally broadcast on German and Nigerian television, Berliner Jazztage '78 (1978) is some of the best live footage of Fela Kuti ever captured on film. As a headliner of the prestigious German music festival, Fela takes the stage with Afrika '70 and captures the hearts of the audience with a raucous, high-energy, exciting musical performance. Almost all modern music owes something to the work of Fela Kuti, and the movement that he founded. This essential double feature captures his genius at the peak of his power and popularity.